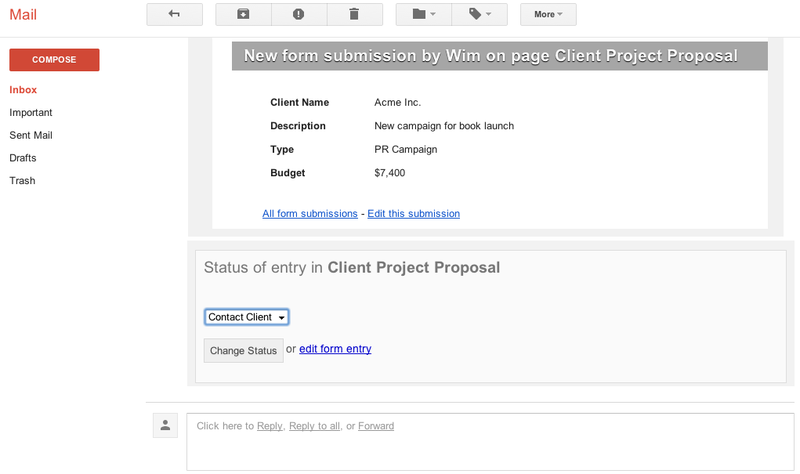 Manage your Form Workflows from your Inbox! 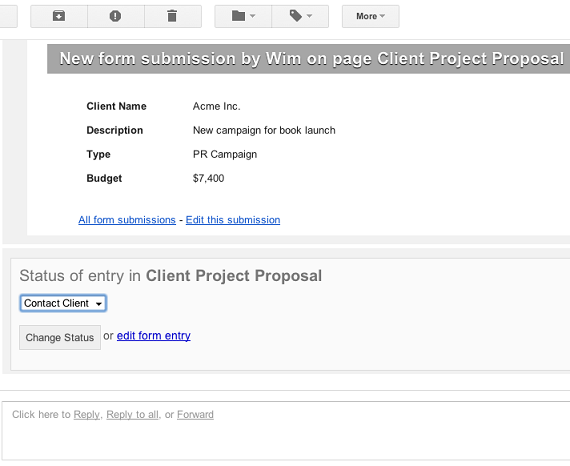 Today we’re announcing more integration for Papyrs with Google Apps! (available for Papyrs for Google Apps users). 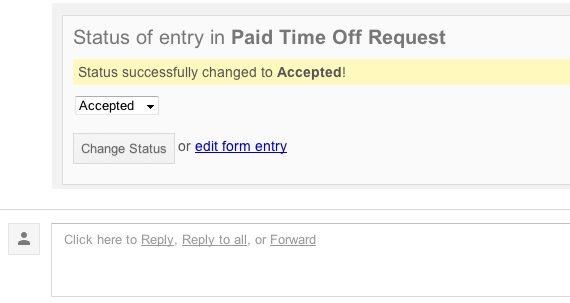 If you’re someone who needs to spend a lot of time in your Google Mail Inbox, you probably already use the Notifications in Papyrs to stay up to date of new page changes and form submissions. Some updates might require you to take some action, especially when someone submits a new request that needs to be reviewed. To reduce the time you have to spend switching between apps, we’re now introducing a Papyrs Widget for Google Mail to help with that! Everytime a form is submitted with a status field, and you’re an administrator for the form page, a widget automatically appears below your mail. Just by pressing a button, you can change the status of the form directly from your Inbox! If we want to change status (e.g. we want to Approve the request), just select the new status and click Change Status. 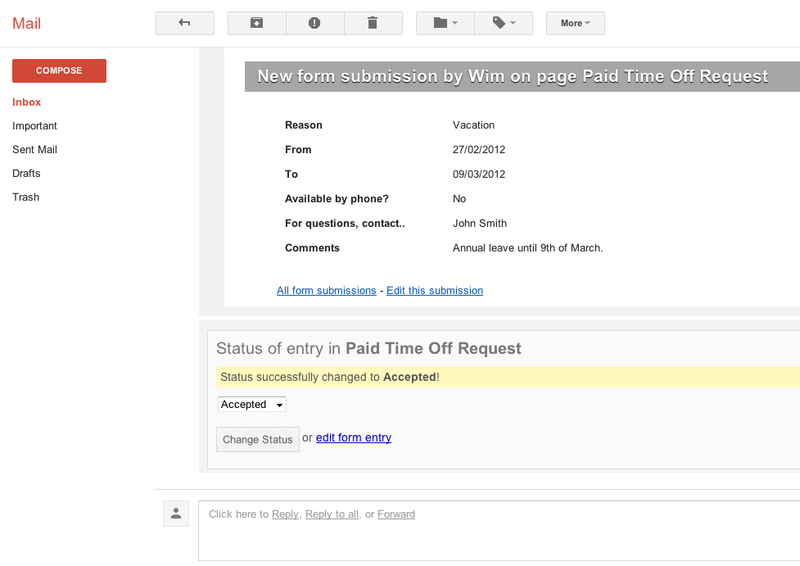 That’s it, the status of the form request will be updated, without having to leave your Inbox! We hope you like the new feature, which is now available to all Papyrs for Google Apps users! Note: if your Google Apps domain is already using Papyrs, your domain administrator needs to approve access to this new Papyrs feature on the Google Apps Control Panel first (http://www.google.com/a/<domain>). We’ll be back with more news about further Google Apps integration, and other features, soon! Want to read more about workflows? You can find more information in our documentation about Form Workflow options.